The Upanishads are unique scriptures on this Earth about the mysteries of life, and the Kathopanishad is unique amongst all the Upanishads. Before we enter into this Upanishad, it will be good to understand the inner current that is underlying this Kathopanishad. The first thing is that in this world, one who wants to know life must himself go through the experience of death. Except for this there is no other way. To know life one has to learn the art of dying. And the one who is afraid of death will remain unacquainted with life also, because death is the innermost and the most mysterious center of life. Only those who enter into death consciously, with awareness and a welcoming heart, can know this life. Everyone dies, but not everyone is able to know life just by dying. You have also died many times, and there is the fear that you will still be dying many times more. But death happens to you involuntarily: you do not want to die but you have to die. That is why death is a sorrow, a pain, an anguish. And the pain of death is so intense that the only way to bear it is to become unconscious. Hence, just before dying, you become unconscious, you go into a coma. Surgeons have discovered only recently that becoming unconscious is a way to avoid feeling intense pain—but nature has always known it. The mind goes into unconsciousness; consciousness is lost because of this fear and the pain of death. You will die in unconsciousness. Many times you have died unconsciously; hence you have no memory of it. You have also been born many times, but unconsciously; and you have no memory of your birth either, so there is no question of remembering past births. This much is certain, that you have been born this time!—but you also have no memory of this birth. To one whose death happens in unconsciousness, his birth also will happen in unconsciousness, because death and birth are simply two sides of the same coin. One who is unconscious on one side will be unconscious on the other side also. One who dies unconsciously is born unconsciously. That is why you have no memory of your birth. You have heard that you were born—your parents say so, your family says so. It is you who have been born but you don’t have any memory of your own birth. And everybody dies, but unconsciously. Hence you remain deprived of what can be learned from death. Religion is the art of dying consciously. Religion is the science of entering into death in total understanding and awareness. And the person who enters death consciously, for him death disappears forever because by dying consciously he knows that he is not dying at all. 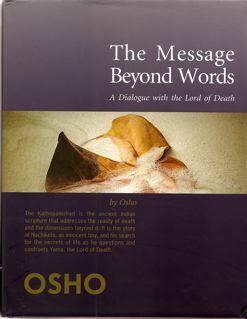 Dying consciously, he knows that what is dying is the body—it is not more than when you discard old clothes—but his inner flame of consciousness is burning bright even in death; even the storm of death is unable to blow it out. For the person who is awake and full of awareness in death, death does not exist. Death exists only for one who dies in unconsciousness. One who dies consciously, for him there is no death; for him, death becomes a door to the deathless, to the eternal. One who dies consciously is born consciously. And one who is born consciously, the whole quality of his life becomes different—then he also lives consciously. Every fiber of his being, every part of his consciousness becomes filled with light, with wisdom, with buddhahood. For one who is born consciously, there will be no death anymore. There will be no new birth for him either. Then he will simply leave the body, only his merging with the cosmic consciousness will survive. The seers have called it nirvana, moksha, kaivalya: the merging with the ultimate reality. One who has known death consciously and realized the deathless, the eternal, has no more reason to be bound to the body. You become identified with the body because you are unconscious. Your unawareness is the bridge, the connection with the body. With awareness the identification is broken—you become separate from the body. As the realization of this separation deepens, death disappears—because it is the body that dies and it is the body that is born. The one who is hidden in the body, the bodiless one, is neither born nor does it die. It is the very life itself. How can life die? And the one who dies, his life was only a deception, and illusion, something borrowed. His life does not mean anything. It is a very interesting thing that man is a combination of two entities: one is the mortal body which is already dead, and the other is the immortal soul which is life itself. It is only because of the proximity of the soul that the body appears to be alive. But the aliveness of the body is borrowed; it is a reflected phenomenon. It is as if you stand before a mirror and see yourself in it: the reflection that appears in the mirror is a borrowed phenomenon, it is not real. The moment you step away from the mirror the image will disappear. It is just a reflection, it is not a reality. It is an indication of the real, and it also hints towards the real—but the one who takes it to be real will go astray. He will be disconnected from the real forever. The body only gives a hint of the life that is hidden within. The body appears alive only because of its nearness, its proximity, to the soul. The aliveness of the soul is so profound that even the material body seems to be alive. But one who takes the life of the body to be life itself will never know the soul. To enter into death means to move from the mirror and to enter into the original reality. This is the essence of this Upanishad.